Printing Year: 1977 to 1995. One Half of Robertson Davies: Viking/1978. ISBN: 0670526088. Markings: Published in 1978 by the Viking Press with no other printings noted, thus a first edition for this publisher at this time. 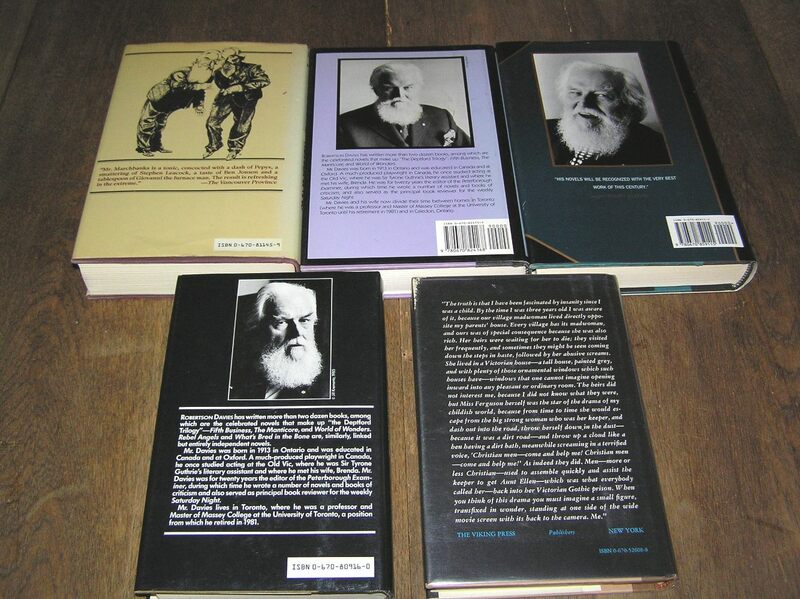 Condition: Book-VGood+/Dust Jacket-VGood. Book: Bumping top/bottom spine. Dust Jacket: Shelfwear top/bottom spine. Some scuffing to panels. What’s Bred In th Bone: Viking/1985. ISBN: 0670809160. 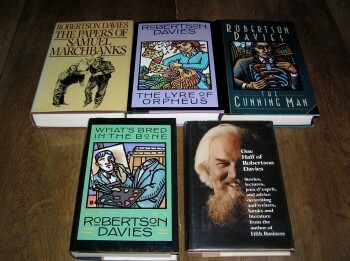 Markings: First American Edition Pubished in 1985. Condition: Book-VGood+/Dust Jacket-VGood+. Book: Bumping top/bottom spine. Dust Jacket: Bumping top/bottom of spine. The Papers of Samuel Marchbanks: Viking/1986. ISBN:0670811459. Markings: First American Edition Published 1986. Condition: Book-VGood+/Dust Jacket-VGood. Book: Slight bumping top/bottom spine. Dust Jacket: Slight bumping top of spine. Some fading to spine. The Lyre of Orpheus: Viking/1989. ISBN:067082416X. Markings: First American Trade Edition Published 1989 by Viking Penguin Inc. Condition: Book-VGood+/Dust Jacket-VGood+. Book: Slight fade to top board edges. Dust Jacket: Stain on inside of jacket. The Cunning Man: Viking/1995. ISBN:0670859117. Markings: First American Edition, plus Number Line 13579108642. Condition: Book VGood+/Dust Jacket: VGood+. Book: Small scuff on back exterior board. Dust Jacket: Pin head nick to back panel. 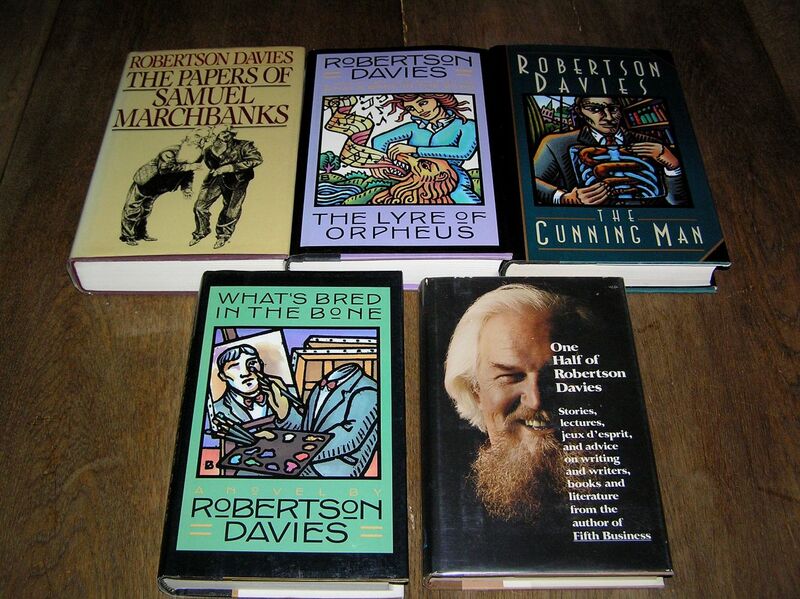 Be the first to review “ROBERTSON DAVIES Set of Five 1ST EDITIONS” Click here to cancel reply.